← Are You Better Off … ? Wanna scare your Tea Party friends? Just yell “Big Government!“ The effect will be like throwing a slab of pork in a Taliban gathering. Or mailing a Dutch cartoon to an Egyptian lynch mob. Is the government too big? Are taxes too high? Has Obama increased taxes? Are we headed to confiscatory taxation? Are we preventing a prosperous, free market system from producing wealth for all by trying to redistribute the goodies? We have to answer these questions honestly if we are to do the right thing and have the economic stability we seek. All rich countries have high taxes because wealthy societies have high demand for public goods. In countries where we do not have a real tax system such as Afghanistan or Pakistan or even India there is no widespread wealth. Prosperous societies are built on collectively created infrastructure, mass education, public health, a safety net and sophisticated social obligations and luxuries. Luxuries, such as support of the Arts, National Parks, Space Programs, Research & Development, Clean Air and Water etc. Also a superpower such as the U. S. has defense obligations as well as security needs. We need libraries, firefighters, police, coastal protection, disease abatement, satellites for communication, Internet safety and reliability, a reliable Power Grid, the FAA for safe air traffic and many other institutions that we have carefully built over the years that enable us to do commerce, enforce contracts, adjudicate disputes, facilitate interstate business and allocate our natural resources. We have a world class University system, research labs, DARPA (for defense related research needs), National Science Foundation, National Institutes of Health and many, many other excellent government funded, efficient prosperity producing institutions. (All ripe for defunding by the ideologues of the right who want right back in to run the country). These institutions have given us the Internet, our satellites and the GPS system, and virtually all the technologies that made us rich in the last century. The government also acts as the insurer of last resort. It allows us to take risks that no private entity is big enough to take. For example the government insures nuclear plants, takes on the disposal of nuclear waste, has a Federal Emergency Management obligation (through FEMA), insures bank deposits, insures ordinary people against temporary unemployment, disability etc. Our Social Security and Medicare/Medicaid programs are examples of social contracts that we set up with the government for our collective Safety Net. These are not welfare, but are based on insurance premiums (Payroll Taxes) that are paid into the system for the benefits. And, yes, we do also have Welfare – we are a civilized bunch. How much do we pay in taxes for all this? In 2010 we paid 24.8% of GDP. This includes ALL taxes: Federal Income Tax, State Income Tax, Payroll Taxes, Property Taxes, Sales Taxes, Excises, Duties etc. Federal Taxes amounted to 15% of GDP and Federal Income Taxes were just 6% of GDP! See Chart on Right. This is the lowest ratio of any rich country in the world except Mexico and Chile. In most European countries the taxes paid are much higher, ranging from 40-50% of GDP and these countries are prosperous, have free markets and better standards of public welfare than we do. By contrast India is at 17%, Pakistan at 10%, Afghanistan at 7%. and have proportionately low prosperity. Since 1970 we have continuously lowered taxes in America, particularly on the rich. Income Taxes are the lowest ever. Corporate taxes are minuscule. 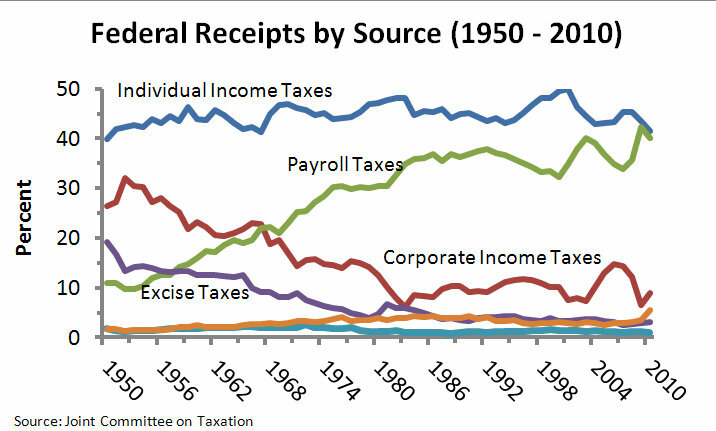 The only tax that has gone up in the past few decades is Payroll tax. See chart on left. 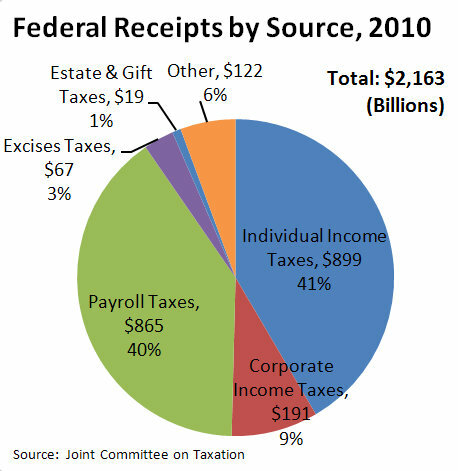 Income tax and Corporate tax together are about half of the total federal tax collected. (Down from 70% in the last decades). We have a near flat tax system now (although you wouldn’t know this if you heard Mitt Romney’s tirade about the 47% paying no taxes.) See chart below, taken from Wikipedia, which shows that if you include all taxes, not just Federal Income Tax, we have a nearly flat tax rate across income levels now. Many other sources I have looked at confirm this. It’s hard to imagine a flatter income tax distribution. The chart shows that the top 1% of income earners, who make about $1,370,000 a year per family, and represent collectively 21% of all money earned, pay about 21.6% of the total taxes. People in the middle class or those making in the range of $50,000 – $200,000 earn about 70% of the total income and pay about 72-75% of total taxes. 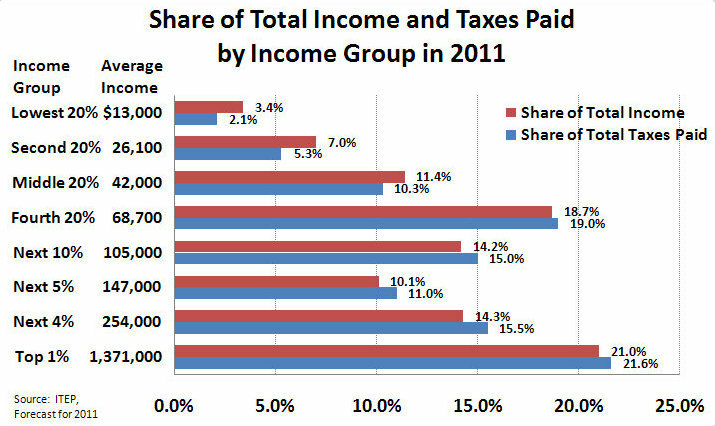 The bottom 40% earn about 10.4% of the income and pay approximately 7.4% of the taxes. Income here includes all sources, such as, welfare, social security, veteran’s benefits, food stamps, earned income credits etc. – all the programs of dependency built into Obama’s socialist setup. If you don’t include government assistance the bottom 47% (the Romney 47, if you will) earn about 9% of total income, pay 7% in taxes and have a median income of about $20,000 per year per household. Many are retired or war veterans or students or unemployed. With all our requirements for public goods our taxes are abysmally low and it shows. We alone in the civilized world can’t provide universal health care. We have 50 million uninsured and 20,000 avoidable health related deaths a year. Medical bankruptcies are on a steep rise. Our education system is going down in tandem with our reduction in top tax rates – we rank very low among the rich countries. Our students can’t afford college – the typical debt load of a graduate is $40,000 to $100,000. It takes a lifetime to pay off and the poor are increasingly being shut out. Our infrastructure, once the envy of the world is breaking down – we need $2-3 trillion just to repair it and trillions more to modernize it. We are cutting down on Space and Science. We run a deficit of billions even when borrowing from the Social Security Trust Fund, which has had a surplus for two decades, and we now claim we cannot afford the safety net and must renege on the social contract. We will not even pay for the wars we have waged and the modernization of our defense and intelligence services. We minimize government expenditures for green energy or carbon reduction and follow rather than lead versus countries like Germany. We have a national debt of $16 trillion and rising. But we do asinine things like taking a no-new-taxes pledge. No, we go beyond no-new-taxes in our astonishing stupidity – we want to lower taxes further, ballon our deficit even more and make the tax system redistributive from the poor to the rich! The income tax in the U.S. was started to pay for World War I. Young men were being conscripted and it was said that patriotism demanded the dollars and cents of people with the ability to pay. The tax was imposed only on the rich. There has been an unprecedented redistribution of our nation’s wealth from the middle class to the rich. This is not a matter of class envy. It is a matter of fairness and true patriotism. As a member of the upper 1% in income and wealth I say to all 1 per centers: Let’s show our true patriotism – a much larger love for our country than singing America The Beautiful while berating our working class as lazy and dependent. Let’s pledge a “I’ll Support America with my Dollars” movement and fight for fair and sensible tax levels for all of us who have benefitted so much from the prosperity of this nation built upon the sacrifices of those at the bottom and middle. What’s wrong with the tax levels we had in the 1990’s – the economy produced 22 million new jobs and we actually had a surplus at the end? It’s not Soak the Rich – It’s not Class Warfare. It’s just fair. And, believe me, there’s no fiscal cliff in a reversion of marginal rates for those at the top of the pyramid – only shared prosperity. I, for one, think I will become even more prosperous if our capitalist system is built on a solid foundation of prosperity for all. Just as it takes two legs to walk it takes both public and private enterprise to built a successful, free market society. Obama was right – You alone did not build it, you had the whole of the 99% helping you! This entry was posted in Current Events, Education, Healthcare, Innovation, Money, Politics, Science. Bookmark the permalink. Nice write up, but what tax bracket are you in and are you willing to pay more? Hi Ashok, great piece – grounded in solid research with facts. And, your clarity of thought is commendable. Thanks for writing this – especially for your generosity, honesty and true patriotism:-) Hope lot more 1%’s will come forward to the cause – very much needed for this election. Note: my question is intended to be rhetorical, not personal… Although the importance of taxes is clear, we still tend to avoid our full civic responibilities…. My point is that the dialog in this country has been seized by those who think it’s self-evident that we pay too much in taxes and that government is too big and inefficient. It does not serve us and therefore we hate paying our taxes. The poor are lazy and addicted to welfare so why should we help or do our civic duties? It’s the tenor of the “extreme” right – which is fast becoming all of the right. So even though, as you say, we still tend to avoid our civil responsibilities, we will do so less if we inculcate a culture of gladly and fairly paying our share and enjoying the fruits of civil prosperity. ‘I got mine and to be doubly sure I will place it in Swiss banks and Cayman Island’. What’s this patriotism humbug? – not serious. Hope so. Well said. It has become something that most people are afraid to talk about. If only more people would read this, and have some light shed upon the subject. There is no denying your clear as crystal logic. I am sharing with my 3 American children. Let me know what these rich Americans, that you’re the mother of, think. Well said. Your clarity of thought is commendable. While your message is directed to fellow one percenters where I don’t belong, but your message is so persuasive that I am willing to pay more than I am paying now. If you browse around the second site you’ll get a lot of data – some a few years old on India’s tax rates. Very nice and thoughtful piece – easy for me to say since I am NOT in the 1% !